Also: more revenue and more profit. On Tuesday, Farmers Business Network, a San Francisco company that sells advice to farmers based on data from the farm and public information like weather patterns, became the latest startup in this field to draw notice when it closed a round of venture capital funding that included Google Ventures, but the trend has been building for several years. Companies like Monsanto, tractor maker Deere, and technology giants IBM and Intel are among those already competing with a growing gang of Silicon Valley startups, all hoping for a proliferation of Keith Larrabees: farmers who will see data as an integral part of farming, as important as a reliable tractor or good seed. 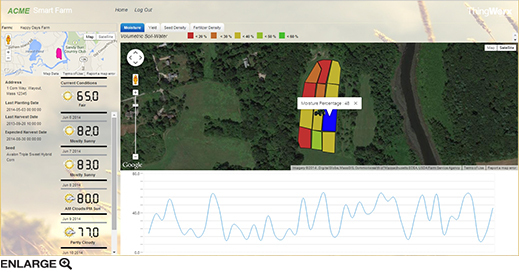 A company called PTC makes a platform, pictured here, that displays relevant data for farmers. A survey conducted last year by the American Farm Bureau Federation, a farm trade association, found that 39 percent of respondents in major corn- and wheat-growing states were using sensor-­driven technologies on their farms. “Farming is moving from being an act of intuitive decision making to an act of analytical decision making,” says David ­Friedberg, CEO of Climate Corporation, a data modeling firm that Monsanto bought for $930 million in 2013. This shift has been made possible in the United States by the proliferation of wireless networks in farm regions and the popularity of smartphones that can deliver information to farmers working in the fields. Major tractor manufacturers have been including hundreds of inexpensive sensors on field equipment for a decade, making it possible to collect data like the topography of each field and the location and depth of each seed planted. Drones and smaller satellites promise to continue the data generation by making it increasingly possible to capture frequent, high-quality images of small sections of field, at a far lower cost than traditional photography from a piloted plane. This kind of information can be especially useful when combined with large data sets that government agencies have made available—largely free—in recent years. Among them: troves of historical soil surveys, weather data, and satellite imagery. Because there are so many sensors, and every data point from a farm sensor has a place and time stamp, the volume of information being generated is enormous, creating a technical challenge for those trying to analyze it. The amount of data from one large farm might be counted in the hundreds of terabytes, according to IBM. Creating the infrastructure to handle that much data will be complicated, says Vin Sharma, a director in Intel’s big-data analytics unit. If companies can create services that turn this abundance of data into money-saving advice, the effect could be crucial for farmers operating on tight margins—in the United States, corn-belt farmers on rented land cleared around $20 an acre in net profit last year. Combining information like localized weather forecasts with details about topography, water levels in the soil, and the seed that has been planted in a field, a company like Climate Corporation will advise farmers about how much fertilizer, an expensive item, to put on a field and when to do so. But how good is the advice coming from the many companies angling to become the farmer’s data advisor? Respondents to the American Farm Bureau Federation survey reported that the technologies they are using have reduced their input costs—a category including fertilizer and seed—by 15 percent on average and increased their crop yield by 13 percent. Still, many farmers remain skeptical. “I don’t think farmers will be excited about these [data-driven recommendations] until they see the payoff,” says Carl Dillon, an agricultural economist at the University of Kentucky.